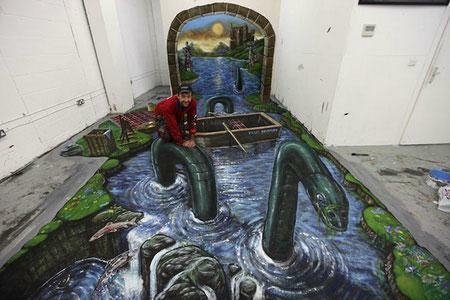 This is a wonderful 3D illusion of a serpent in water which resembles the Loch Ness monster from the Scottish Highlands, possibly one of the worlds best known cryptids. This very creative piece of artwork was drawn using different coloured chalks by street artists Joe Hill and Max Lowry who decorate streets around the world. As you can see from looking at this image they are true masters of anamorphic drawings. love these pictures so amazing so mind bubbling i love it think about them and tell others.